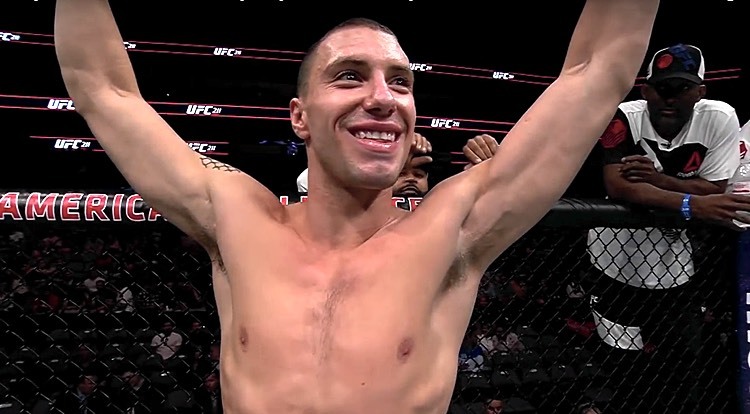 James Vick will not make a single excuse for his last performance. After scratching and clawing his way into the top 15 rankings at lightweight, Vick volunteered to face Justin Gaethje in the main event of the UFC Fight Night card from Nebraska last August in hopes that he could climb into title contention with a win. Instead, Vick suffered a brutal first round knockout, which ended his four fight win streak and put him back down a few rungs on the ladder in an already stacked 155-pound division. “Honestly I just got caught,” Vick told MMAWeekly about the loss to Gaethje. “I let my back get too close to the cage and I didn’t have anywhere to go. I ate a haymaker. He threw a haymaker shot, the biggest punch he has in his arsenal and it basically hit me right on the chin. While it’s not uncommon for fighters to validate a loss by pointing the finger at an injury or a bad training camp, Vick refuses to do any of that when it comes to his last loss. “This fight game is a game of inches,” Vick explained. “I didn’t overlook him. I train hard for everyone. Of course, I thought I was going to win. I think I’m going to win every time. I don’t think that believing you’re going to win every fight is overlooking someone. To me, not training hard [is overlooking someone]. I train hard for everyone. The loss may have slowed down Vick’s momentum but it didn’t dampen his desire to become UFC lightweight champion one day in the future. This weekend, Vick has a chance to get back on the horse when he faces Paul Felder in a marquee co-main event slated for the first ever UFC main card airing live on ESPN. Vick can’t erase what happened in the fight with Gaethje but he’s going to do everything possible to take out his frustrations on Felder to ensure he returns to the win column. “I still believe I have a chance to be a world champion. 100-percent, I believe that with my heart,” Vick stated. “I still have one of the best records in the UFC. I don’t know how much I move up [the rankings] beating Felder cause he’s ranked a little bit below me and the division is so chaotic right now. Vick mentions the rankings at a time when so many fighters appear to be disenfranchised by a system that is supposed to help determine title contenders yet often times ends up with athletes frustrated or disappointed. Even with the No. 1 next to a fighter’s name, there is no guarantee that person will get the next crack at the champion. Despite those criticisms, Vick absolutely pays attention to the rankings because he sees it as a gauge to measure where he’s at in the division while also targeting potential opposition. When he was on the outside looking in at the top 15 fighters in the world, Vick was begging the UFC for any opportunity so he could finally crack the rankings. Now that he’s amongst the top 10 fighters in the world, Vick has no plans to give that up and if anything he’s only that much hungrier to climb even higher starting with this fight. “I absolutely care about those rankings,” Vick said. “I’m never going to be one of those guys that says ‘oh I don’t care about winning or losing or I don’t care about the rankings, I just want to put on a good performance’. To me, that’s a journeyman’s mentality.